Air Europa started in 1986 (registered in Spain as Air España SA and previously known as such) as part of the British ILG-Air Europe Group and 75% owned by Spanish banks. 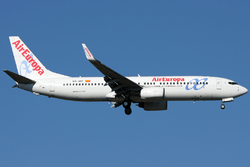 It originally had a similar livery to Air Europe but with Air Europa titles, aircraft were registered in Spain and flew holiday charters from Mediterranean resorts and European cities using Boeing 737-300 and Boeing 757. 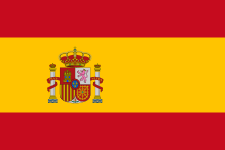 It was the first Spanish private company to operate national scheduled flights (besides charter flights which used to be its main business). When parent company ILG ceased trading in 1991 Air Europa continued profitably with a larger fleet of Boeing 737s and 757s. It signed a franchise agreement with Iberia in January 1998, but this has since been dissolved. It is now owned by Globalia Corporación Empresarial S.A. At the end of the 1990s Boeing 737-800 jets were introduced along with a new livery. In June 2005 it was announced among the four future associate members of SkyTeam alliance, due to join by 2006. However, the joining date was postponed, and it did not become a member until 1 September 2007. Air Europa was the parent company for Air Dominicana, the new flag carrier of the Dominican Republic, until bankruptcy was declared on 21 September 2009. Air Europa retired their last 767 on 13 April 2012. They also operated as Air France between Valencia Airport and Charles de Gaulle Airport with daily Boeing 737-800 service. Air Europa operates tour services between northern and western Europe and holiday resorts in the Canary Islands and Balearic Islands. It also operates domestic scheduled services and long-haul scheduled services to North America and South America. Its main base is Palma de Mallorca Airport, Palma de Mallorca. During the last ten years, scheduled flights have increased their share of operations. Boeing 787-9 – 16 TBA Replacing older A330-200. ↑ "Corporate Information / Globalia." Air Europa. Retrieved on 17 December 2010. "Air Europa Líneas Aéreas, S.A.U. ·Centro Empresarial Globalia. Apdo. Correos-132. 07620 Llucmajor - Baleares - Spain"
↑ "Bases_Sorteo_Ginebra.pdf." Air Europa. Retrieved on 8 November 2012. "AIR EUROPA LÍNEAS AÉREAS S.A. (Sociedad Unipersonal), con domicilio en Polígono Son Noguera, Carretera Arenal-Llucmajor, Km 21,5 de Llucmajor, Mallorca,"
↑ "Fact Sheet." SkyTeam. Retrieved on 27 December 2008. ↑ World Airline Directory. Flight International. 16–22 March 2004. "62." "Centro Empresarial Globalia, PO Box 132, Llucmajor, Baleares, 07620, Spain"
↑ Air Dominicana listed as defunct. Retrieved 2009-09-29 Archived August 23, 2009, at the Wayback Machine. ↑ "Directory: World Airlines". Flight International. 2007-03-27. p. 56. ↑ "Air Europa #3 in Madrid; operates mix of domestic, long-haul and some EU services". anna.aero. 12 September 2008. ↑ "Profile on Air Europa Lineas Aereas". CAPA. Centre for Aviation. Archived from the original on 2016-11-01. Retrieved 2016-11-01. ↑ "Air Europe fleet list". Planespotters.net. Retrieved 2012-09-25. ↑ "Air Europa A330 Fleet". 1 2 "Planespotters.net". Planespotters.net. Retrieved 2014-12-17. ↑ "Air Europa firmó en 2015 acuerdos para adquirir 20 aviones Boeing 737-8". expansion.com. Retrieved 2016-04-27. ↑ "B787 orders aireuropa.com blog". billete996.aireuropa.com. Retrieved 2014-12-17. ↑ "B787-9 order". money.cnn.com. Retrieved 2015-01-15. ↑ "Air Europa Fleets". Airfleets.net. Retrieved 23 August 2012.